Have you heard? About the Adore Home Sydney shopping tour? Join Emma Blomfield from Nest Designs on a tour of the best homewares stores in Sydney's Northern Beaches (Manly to Palm Beach), along with a delicious lunch. There are 2 ticket options to choose from - Standard $121 - includes charter bus, lunch and mini goodies bag and VIP $176 - includes all of the above plus a copy of the Adore Home book once it's released early next year. 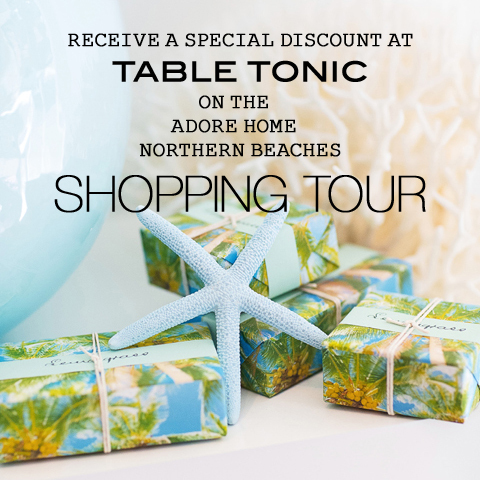 Table Tonic Avalon will be offering an exclusive storewide discount (it's a good one people) for guests, and a couple of stores will also give styling tips and tricks. The tour will run from approximately 9am-4pm on Saturday 19th October and promises to be a fun day out, shopping with like-minded interiors-obsessed people. If you're interested in attending, mail Loni - info@adoremagazine.com. Hurry spots are limited! Want to spend a day shopping my hood? Course you do. Click to visit Adore Home.